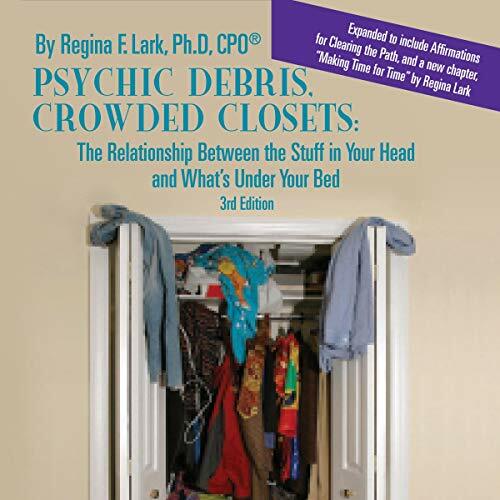 In this new audiobook, author Regina F. Lark, PhD, narrates her highly acclaimed Psychic Debris, Crowded Closets: The Relationship Between the Stuff in Your Head and What's Under Your Bed - 3rd Edition. This audiobook continues the journey toward self-discovery based on new information in the realm of time management and productivity. Although “time management” is impossible (time is fixed, and we can’t do anything about it! ), the new chapters unlock the mysteries of managing your relationship to time. Also new is a list of positive affirmations to help unclutter the mind of psychic debris - “head trash” that keeps us from realizing our goals. Is a cluttered closet a manifestation of a cluttered mind? Regina Lark's Psychic Debris and Crowded Closets is about understanding the relationship between the stuff in our head and what's under our bed. This audiobook will serve listeners as a workbook, a journal, and a reflection of your desire to learn more about your connection to clutter and its impact on body, mind, and spirit. Open your heart and head, and your closets and cupboards, and then consider these alternate ways out of the mess. Psychic Debris and Crowded Closets creates the foundation to help your understand your relationship between the stuff in your head and what's under your bed. so inspiring ! listened over and over . thank u for the boot up the bottom I needed !